Electrical conduit often used to protect and routes wire and cables. It is made of many materials based on different using place, like steel, metal, plastic, fiber etc. General there are two kinds of metal electrical conduit, flexible metal conduit and rigid conduit. But they are usually used in totally different places. When to used flexible metal conduit, compared to rigid conduit. The choice can be made by analyzing your wiring and cable routes and see which kinds of conduit will work better. 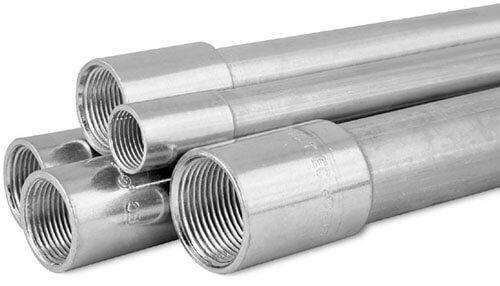 As we know, rigid conduit is harder to be bend, it seems that flexible metal conduit is easier to work with than rigid conduit. But the thickness of flexible metal conduit is thinner and less strong than rigid conduit. So in the straight or 90 degree corners, rigid conduit is more available. In the wiring places which are more complicated and more flexible, flexible metal conduit are more useful. In the most places, we always use the flexible metal conduit routes wiring if the rigid could not arrive. Attention to some details when using flexible metal conduit. 1. Although flexible metal conduit is flexible and easy to be bend, but we should pay more attention to the ends. There are some metal sheets and use to cut your body. 2. After we put the wiring through in it, we must fix them, because it is flexible. We must check it is stable or not before finishing. 3. Flexible metal conduit is not water-proof, so it is used in the dry place. If you want to use them in the wet place. please cover some water-proof material or metals.